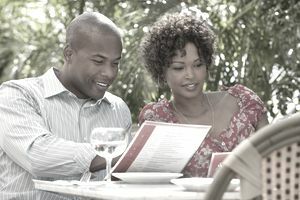 A restaurant dinner menu should include a variety of items, many of which cross over to the lunch menu. By using ingredients on several different menu items, you can keep your inventory low, reduce spoilage waste, and maintain low food costs. Along with the dinner menu, a new restaurant could add an appetizer menu, dessert menu and vegetarian menu to expand their selections. Caesar Selections – Crisp romaine lettuce tossed with our homemade Caesar dressing, croutons, and shredded parmesan cheese. With chicken, $8.95; shrimp, $9.95; crab cake, $11.95; steak, $13.95; lobster, $15.95. Spinach Salad – Fresh spinach, mushrooms, and hard-boiled egg served with warm bacon vinaigrette, $7.95. Lobster Bisque – Fresh minced lobster in a thick, creamy broth with a touch of sherry, $5.95 cup/$7.95 bowl. Traditional New England Seafood Chowder – with clams, scallops, and shrimp, $5.95 cup/$7.95 bowl. French Onion Soup – with gruyere and a savory crouton, $3.95 cup/$5.95 bowl. Rustlers Ribeye – Thick, hand-cut prime rib, grilled to order, served with a baked potato and seasonal vegetable medley, $23.95. Roast Pork Loin – Slow roasted pork loin finished with a portabella demi-glace. Served with marrow-scented couscous and wilted kale, $21.95. Veal Saltimbocca – Tender veal cutlets sautéed with fresh sage and prosciutto. Finished in the oven with mozzarella and served atop creamy asiago linguini, $19.95. A.D.’s Chicken Saltimbocca – Boneless chicken breast sautéed with fresh sage and prosciutto. Finished in the oven with mozzarella and served atop creamy asiago linguini, $19.95. Emeril’s Chicken – Boneless chicken breast sautéed with mushrooms, spinach, artichoke hearts, fire-roasted red peppers, and sun-dried tomatoes. Finished with a chipotle-chevre sauce, $19.95. Chicken Scampi Roja – Boneless chicken breast sautéed in a scampi sauce with sun-dried tomatoes, artichoke hearts, and spinach. Tossed with linguini and finished with roasted red pepper pesto and the chef’s choice of ravioli, $19.95. Traditional Chicken Scampi – Boneless chicken breast sautéed with mushrooms and fresh garlic. Finished with white wine, sweet cream butter, and linguini, $17.95. Chicken Marsala – Boneless chicken breast sautéed with mushrooms and finished in a marsala and cream reduction, $16.95. Chicken Picatta – Lightly breaded boneless chicken breast sautéed in butter and white wine sauce, finished with capers and freshly squeezed lemon, $16.95. Seafood Sauté or Alfredo – Fresh haddock, sea scallops, gulf shrimp, and chef’s choice of ravioli tossed in your choice of sauce. With garlic and white wine, $19.95; homemade alfredo, $22.95. Sautéed Seafood Caprese – Fresh haddock, gulf shrimp, and sea scallops sautéed with fresh tomatoes, basil, and garlic, finished with fresh mozzarella, $22.95. Shrimp Scampi Roja – Fresh gulf shrimp sautéed in a scampi sauce with sun-dried tomatoes, artichoke hearts, and spinach. Tossed with linguini and finished with roasted red pepper pesto and the chef’s choice of ravioli, $19.95. Traditional Shrimp Scampi – Gulf shrimp sautéed with mushrooms and fresh garlic. Finished with sweet cream butter, scallions, and white wine, $17.95. Catch of the Day – Please ask your server (market price). Beer-Battered Seafood Platter – Fresh haddock, gulf shrimp, and sea scallops dipped in beer batter and fried to a golden brown. Served over a mountain of fries, $18.95. Baked Stuffed Seafood Selection – Your choice served on our homemade crab meat stuffing. With haddock, $15.95; jumbo sea scallops, $18.95; gulf shrimp, $17.95. Simply Broiled Seafood Selection – haddock, $13.95; jumbo sea scallops, $16.95; gulf shrimp, $15.95.